Massachusetts, which is located in New England along the eastern seaboard, is a four-season state and encompasses zones 5 and 6 on the USDA Plant Hardiness Zone Map. On the eastern, or coastal side, Massachusetts is zone 6 and experiences minimum temperatures of -5 degrees F. The central and western regions are in zone 5, where temperatures may drop to -15 degrees F. Many trees thrive in this climate, including some that provide white flowers, even during the winter. 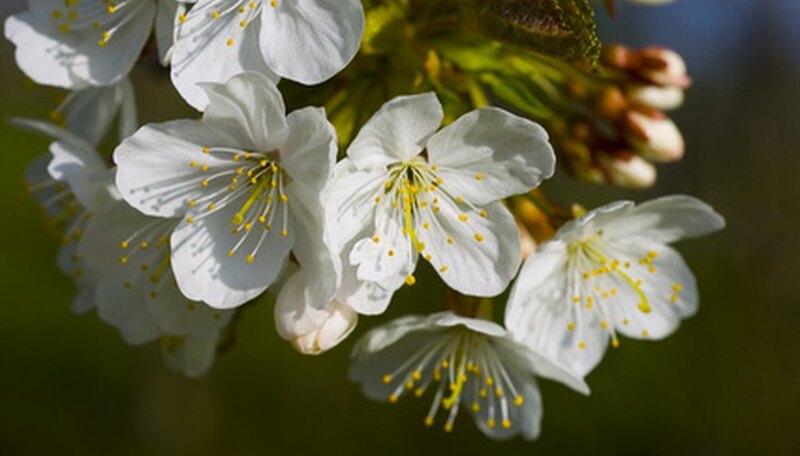 The Autumn Cherry (Prunus subhirtella) has a double white or pink flower that blooms during warm fall, winter and into early spring. This tree, which can grow to 30 feet and may have a spread up to 30 feet, has a loose branch configuration and bushy leaves. Leaves on this tree may be 1 to 4 inches long and turn yellow or bronze before dropping in the fall. The autumn cherry prefers full sun and moderate water. A member of the same family as the Bradford Pear, the Cleveland Pear (Pyrus calleryana) is an ornamental tree that is not grown for fruit but does produce a profusion of white flowers in the spring. The leaves, which may be 1-1/2 to 3 inches long, are a leathery green and will turn red, purple or orange before dropping. This tree can reach 30 feet with a spread of 15 feet and should be planted in full sun and get regular water. A crape myrtle hybrid that is technically known as Lagerstroemia x Natchez, the Natchez Crape is a prolific bloomer that is hardy enough to weather coastal Massachusetts winters and bring a little southern foliage to the area. The Natchez Crape can grow to 30 feet, and leaves are long and narrow. Flowers, which bloom in summer, are in small clusters. Prune trees in late fall or early winter, as these trees bloom on new growth. Plant in full sun and water moderately.